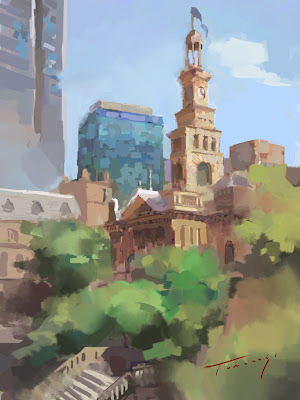 This was done on the iPad again on the Brushes App in front of Sydney Town Hall. I was lucky enough to get it on a gorgeous day. Sydney isn't a bad place at all. Great weather, beautiful landmarks lots of inspirational places to sit and draw. Here I sat inside the Kinokuniya book store opposite Town Hall painting for about 2 hours. The security guard was sussing me out every 15 minutes trying to figure out what I was doing. Although it's on iPad advertising now, I guess painting is not what normal people do when they visit a bookstore. Looking forward in seeing what else Sydney has in store. Awesome Nori!!! Your plein air paintings are great! Wonderful stuff! How do you find using brushes to paint on the iPad ,have you tried any of the other apps for painting yet? I'm just starting out on theiPad painting path, and trying to work out how to translate some of my traditional painting methods into a digital style. archive for you to choose from. living room. She loves tulips and actually has those growing in the garden now, not far from the framed canvas print. flowers has now stood for 600 years.